Yesterday, London's Metropolitan Police (a/k/a Scotland Yard) released hate crime figures for the year that ended June 30, 2015. During that period, there were 816 anti-Muslim crimes, up 71% from the 478 crimes the year before. There were 499 anti-Jewish hate crimes, up 93% from the 258 crimes the year before. In all, London police reported 13,007 hate crimes motivated by race and/or religion; they were not broken down except for crimes targeting Muslims and Jews. Westminster was reportedly the borough with the highest number of anti-Muslim incidents during this time period, with 54. Hackney and Barnet were reportedly the boroughs with the highest number of anti-Jewish incidents, with 122 and 120, respectively. About 60% of the anti-Muslim hate crimes targeted women. Details about the anti-Jewish crimes were a bit more difficult to come by. According to the 2011 census, there were 1,013,000 Muslims and 149,000 Jews living in London, as Islamist Watch reported previously. Based on these numbers, per capita, there was one hate crime incident for every 1,241 Muslims and one for every 299 Jews in London last year. Troubling numbers all around. Unfortunately, the police announcement and coverage by British media (e.g., here, here, here, and here) have focused heavily on the anti-Muslim component and underreported the rise in anti-Jewish crime. 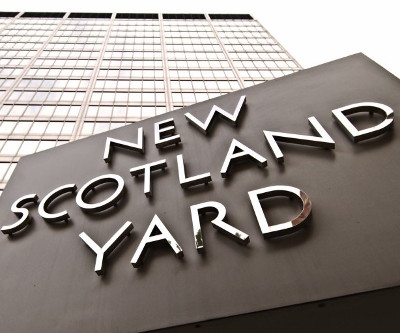 Diversionary tactic: Police wanted to throw a bone to the Muslim community to divert attention from another press release Scotland Yard issued the same day, about its efforts at preventing extremist radicalization. (That report carefully avoids characterizing the "extremists" or "terrorists," and the word "Muslim" does not appear in it.) So they issued a press release focusing exclusively on Muslims as victims. Bad taste: According to the ISGAP report issued last May, "Cautious estimations put the percentage of Muslim perpetrators of antisemitic acts in Great Britain at between 20 and 30 percent, while the percentage of Muslims in the general population stands at 5 percent." Perhaps police data confirmed that Muslims committed a large share of the anti-Jewish crimes, and it seemed gauche to focus on both anti-Jewish and anti-Muslim crimes in the same press release. The squeaky wheel gets the grease: Muslim advocacy groups, aided and abetted by media (as noted above), complain often and loudly about real and imagined injuries to the Muslim community, and pressure police to give disproportionate attention to crimes against them at the expense of others targeted at a higher rate, like Jews. In fact, it's odd that no other hate crime victims were mentioned given that religiously-motivated hate crimes actually make up only a small percentage of the 13,007 hate crimes targeting race and religion last year. Also during this time period, there were 1,667 hate crimes against homosexuals – more than twice as many as anti-Muslim hate crimes – but they aren't mentioned at all either. It's passé: Police already reported that hate crimes against Jews were increasing. In fact, it looks as if the rate of increase is leveling off. Hate crimes for the last eight months of 2014 were more than double the number during the same period the previous year. By contrast, the rate for July 2014-June 2015 was "only" 93% higher than the previous year. So there's nothing to worry about. Senior moment: Police forgot that Jews were targeted at a much higher rate than Muslims. Order of importance: The Jewish population is so small (about a tenth the size of the Muslim population) that it just didn't seem worth mentioning. None of these explanations is very satisfying, or flattering to Scotland Yard. Here's hoping future police reports about hate crime will be more complete.